Are you looking for the best tuition centres in Kolkata of ICSE & CBSE Board? Do you want to know the name & address of ICSE / CBSE Coaching Centres in Kolkata? It’s very important that every child should get proper guidance during their school life. Thus A2B Learning School of Kolkata established their tuition centres across Kolkata with the aim of providing quality tuitions by experienced teachers to the students of all classes under ICSE & CBSE board at cheapest fee. A2B Learning School of Kolkata is a chain of tutorial centres offering quality tuitions following a unique evaluation system, personalized study materials. It makes students average to brilliant by their intensive tuition program. • A2B Learning School Kolkata Features & Facilities: - It provides tuitions of ICSE & CBSE boarded school students of Class-VI to Class-X. Students will get proper tuitions in Mathematics, Science, Social Science & English subjects during Class-VI to Class-IX and in case of Class-X it offers tuitions only in Science group i.e., Mathematics, Physics, Chemistry & Biology Subjects. A2B Learning School of Kolkata has the well-trained teachers, who follows specific study materials & provides anticipated set of questions with solutions. Each & every learning centres of A2B Learning School in Kolkata are Air-Conditioned & follow easy learning through A2B Memory Techniques. Coaching / Tuition Fees at A2B Learning Schools of Kolkata as follows Rs.2400/- for Class-VI & VII, Rs.3000/- for Class-VII & IX and Rs.4000/- for Class-X students [fees could be changed]. Free mock test, assessments, personalized tips, suggestions and every other required guidance provided by A2B Learning School, Kolkata. • A2B Learning School Kolkata Corporate & Head Office Address: - Suraiya Court, 187 Park Street, 3rd Floor, Near Park Circus 7-point crossing, Kolkata-17. • Phone number of A2B Learning School Kolkata: - 9748414974 / 8100095689. • Email ID: - info@a2blearning.in. • A2B Learning School Kolkata Learning Centre Contact numbers: - A2B Learning School Kolkata has opened few more Learning Centres across Kolkata to reach more meritorious students. Here are the A2B Learning School Kolkata Coaching Centre phone numbers – A2B Learning School Park Street , A2B Learning School Golf Green , A2B Learning School Behala , A2B Learning School Esplanade , A2B Learning School Batanagar , A2B Learning School Sodepur , A2B Learning School Sealdah  and A2B Learning School Liluah . Please visit www.a2blearning.in website of A2B Learning School Kolkata for further details and to open a franchise (learning centre) of A2B Learning School in your locality. Admission Spice TV Initiative Media Academy Behala Kolkata TV & Film Editing, TV Videography, News Anchoring, Acting, RJ Training, VJ Training admission Spice TV Initiative Media Academy Behala Kolkata address phone contact number details. Spice TV Initiative Media Academy Kolkata is a well-known TV Production House of Kolkata and only Media Institute of Kolkata from a Television Channel i.e., Spice TV Channel. Spice TV Initiative Media Academy Kolkata is situated on D.H. Road at Behala area of South Kolkata and has strong placement facility. Students completed courses from Spice TV Initiative Media Academy Behala Kolkata are now working as TV Anchor, News Reader, RJ, Event Host etc in popular Television Channels. Certificate Course News Reading & Anchoring. Diploma in Digital Editing (FCP). Certificate Course Anchoring / News Reading / RJ / VJ/ MC. Documentary Film & TV Videography (With Workshop). Diploma in Broadcast TV & Print Journalism. Diploma in Acting For Film & TV Programmes With Choreography. TV & Radio Advertising Management & Airtime Marketing. Modelling, Choreography, Event & Production Management, Personal Management & Human Resource Management in Media, TV & Film Editing, TV Videography, News Anchoring, Acting, RJ Training, VJ Training and many other short-term & long-term courses are available at Spice TV Initiative Media Academy of Kolkata. Address / Location of Spice TV Initiative Media Academy Kolkata: - 222, Diamond Harbour Road, Opposite of Behala Police Station, Kolkata. Phone Contact Number of Spice TV Initiative Media Academy Kolkata: - 84203-24203 / 9836864975. Website of Spice TV Initiative Media Academy Kolkata: - www.spicetvima.weebly.com. Those who want to make career in media industry and want to become an anchor / News Reader / Actor / Editor etc are advised to contact Spice TV Initiative Media Academy of Behala (Kolkata) as soon as possible for Admission to the batch starting next. ScanTech Computers Educational Institute, a Unit of Newland Infotech Limited (Newland Group), is the Shiksha Ratan 2012 Award Winner and offering career oriented Computer Training in Kolkata & other districts of West Bengal. As on now (2012) ScanTech Computers Educational Institute has its Computer Training Centres at Sodepur (Kolkata), Singur (Hooghly) & Ghatal. Let’s check out more details about ScanTech Computers Educational Institute Kolkata & Other centres. Advance Career Development Course [ACDC] – Minimum eligibility for admission is Graduate in any discipline – Total number of seats 100 [Sodepur centre 50, Ghatal centre 25 & Singur centre 25 – as on 2012]. Certificate & Diploma course in Computer (IT). Job Oriented Course on IT & Soft Skill Development. Crash course for Madhyamik & 10+2 (H.S.) students. Advance Certificate course in Corporate Training. Advance certificate course in Hardware & Networking. ScanTech Computers Training Centre had received the Shiksha Ratan 2012 Award. It’s an ISO 9001:2008 certified Educational Institute & under the Newland Group. ScanTech Computers Training Centre is a Member of Computer Society of India. ScanTech Computers Training Centre offers Grooming & English communication skill classes to the students and has Industry Update Curriculum along with 100% placement support. 100% Lab Practice provided along with Personality Development Programme & School Level Computer Education Project facilities at ScanTech Computers Training Centres. ScanTech Computers Training Centre has its branch centres in other districts of West Bengal and in India as well. ScanTech Computers Training Centre Sodepur Address: - Road No.7 HB Town, Sodepur, Kolkata-110. ScanTech Computers Training Centre Sodepur Phone number: - 033-65000129 / 8001001193. ScanTech Computers Training Centre Ghatal Phone number: - 7797100381. ScanTech Computers Training Centre Singur Phone number: - 7797100380. Admission at ScanTech Computers Training Centre Kolkata & Others happens on first-come-first-serve basis; so interested candidates are advised to contact your nearest ScanTech Computers Training Centre as soon as possible for admission / further details. Zee Institute of Creative Art (ZICA) New Alipore Kolkata - Let's check out the facilities, courses, admission process & contact details of Zee Institute of Creative Art (ZICA) of Kolkata. Zee Institute of Creative Art (ZICA), first full-fledged classical & digital Animation Training Institute of India run by Zee Learn, is located at New Alipore in South Kolkata. Those students who want to make career as Animator, Game Designer, Graphic Designer, VFX expert [in Animation & Media Industry] should come to Zee Institute of Creative Art (ZICA) Kolkata as soon as possible. Zee Institute of Creative Art (ZICA) Kolkata is the best Animation Academy of Kolkata to get training on Classical 2D & Modern 3D Animation & Graphic designing. Zee Institute of Creative Art (ZICA) Kolkata maintains state-of-the-art infrastructure and well equipped with high-end Animation Tools, 2D Animation facilities, latest 3D Software & imaging technology in their ZICA Training Studio [includes Visual FX (VFX) Laboratory] of Kolkata. Zee Institute of Creative Art (ZICA) provides Practical training in 2D Animation, 3D Animation, Visual Effects & Gaming along with the Theoretical study covering Visualization stages & Production procedure. B.Sc in Animation & Visual Effects - admission at ZICA Kolkata. B.Sc in Animation Film Making - admission at ZICA Kolkata. B.Sc in Visual Effects Film Making - admission at ZICA Kolkata. B.Sc in Visual Communication - admission at ZICA Kolkata. Diploma in Animation & Visual Effects - admission at ZICA Kolkata. Diploma in Animation Film Making - admission at ZICA Kolkata. Diploma in Visual Effects Film Making - admission at ZICA Kolkata. Diploma in 2D Animation - admission at ZICA Kolkata. Diploma in Animation - admission at ZICA Kolkata. Diploma in Visual Effects - admission at ZICA Kolkata. Diploma in Graphics and Web designing - admission at ZICA Kolkata. Certificate in 2D Animation - admission at ZICA Kolkata. Certificate in Gaming - admission at ZICA Kolkata. Certificate in Graphics designing - admission at ZICA Kolkata. Certificate in Web designing - admission at ZICA Kolkata. Certificate in Rotoscopy - admission at ZICA Kolkata. Candidates seeking admission to Bachelor Degree courses at ZICA Kolkata should be 10+2 (H.S.) or its equivalent examination passed. Candidates should first submit Application Forms [obtainable online / ZICA Kolkata campus] and should submit the applications along with the Documents [10th & 12th Mark Sheet, School Leaving Certificate, 10th & 12th Certificate Copy, Migration Certificate, Birth Certificate, Other Certification (If Applicable), 3 Passport Size Photos] for Bachelor degree course admission at ZICA Kolkata. Candidates seeking admission to Diploma & Certificate courses at ZICA Kolkata should be Class-10 (Madhyamik) or its equivalent examination passed. Candidates should first submit Application Forms [obtainable online / ZICA Kolkata campus] and should submit the applications along with the Documents [Class-10th Mark Sheet, School Leaving Certificate, 10th Certificate Copy, Birth Certificate, Other Certification (If Applicable), 3 Passport Size Photos] for Diploma & Certificate course admission at ZICA Kolkata. • Zee Institute of creative Art (ZECA) Kolkata Address: - 703/E/1, Block-P, New Alipore, Kolkata-53. • Phone contact number of Zee Institute of creative Art (ZECA) Kolkata: - 033-65483077 / 9748015212. For further details on Zee Institute of Creative Art (ZICA), the best Animation Academy of Kolkata, please visit www.zica.org official website of ZICA. Rajeev Gandhi Computer Saksharta Mission (RGCSM), an Autonomous Institution which is registered under the Society & Public Trust Act & recognized by Government of India (NCT), provides the opportunity to learn various Computer courses across West Bengal districts over the years. In each of 19 districts of West Bengal; there are few Rajeev Gandhi Computer Saksharta Mission (RGCSM) Study Centres where students can get career-oriented computer training from educated expertise computer faculties. All the courses offered by Rajeev Gandhi Computer Saksharta Mission (RGCSM) Training Centres are recognized by UGC & registered under the C.R. act of Ministry of HRD [Government of India] and thus the course certificates are acceptable in every company / intuition. Rajeev Gandhi Computer Saksharta Mission (RGCSM), ISO 9001:2008 Certified Organization, has more than 250 Study Centres in West Bengal & over 1800 Study Centres in India to reach every corner of India with the Computer Training courses at cheapest fees [special fee structure for SC/ST students as well]. The certificate given by Rajeev Gandhi Computer Saksharta Mission (RGCSM), associated with UPECL, is acceptable in Employment Exchange through which students will get jobs in future. Diploma in Office Automation & Publishing (DOAP) course contains MS-Office, Accounting through Tally, Internet, Desk Top Publishing (DTP), Website Designing, Computer Hardware etc at RGCSM Kolkata & Bengal. Amongst other Diploma courses – Diploma in Computer Application (DCA), Advanced Diploma in Computer Application (ADCA), etc are available at RGCSM Kolkata & Bengal. Amongst the Certificate courses – Desk Top Publishing (DTP), Tally (Accounting), C C++ VB Languages, Hardware course, Multimedia course etc available at RGCSM Kolkata & Bengal. RGCSM Kolkata & Bengal also offers Undergraduate & Post Graduate Degree courses like BCA [Bachelor degree in Computer Application], MCA, BA, MA etc. Baguiati RGCSM Kolkata Study Centre Phone number is 9804985574. Dumdum RGCSM Kolkata Study Centre Phone number is 9830075018. Birati RGCSM Kolkata Study Centre Phone number is 9433090072. Barahnagar RGCSM Kolkata Study Centre Phone number is 9830530920. Baruipur RGCSM Kolkata Study Centre Phone number is 9903064436. Garia RGCSM Kolkata Study Centre Phone number is 9230840806. Behala RGCSM Kolkata Study Centre Phone number is 9874563844. Belgharia RGCSM Kolkata Study Centre Phone number is 9874681724. Rajarhat RGCSM Kolkata Study Centre Phone number is 9804317585. Barrackpore RGCSM Kolkata Study Centre Phone number is 9051472094. Dakshin Barasat RGCSM Kolkata Study Centre Phone number is 9609220294. Barasat RGCSM Kolkata Study Centre Phone number is 9874574798. Darjeeling RGCSM West Bengal Study Centre Phone number is 9233402391 / 9641505018 / 9851990591 / 9932238011. Birbhum RGCSM West Bengal Study Centre Phone number is 03462-259661 / 9434633149. Medinipur RGCSM West Bengal Study Centre Phone number is 9434161554 / 9732989608. Bankura & Purulia RGCSM West Bengal Study Centre Phone number is 9474048770 / 9002413624 / 9832175358. Burdwan RGCSM West Bengal Study Centre Phone number is 9126170172 / 8900455095. Nadia RGCSM West Bengal Study Centre Phone number is 9883118799 / 9733901259 / 9093284772. Murshidabad RGCSM West Bengal Study Centre Phone number is 03482255812 / 9734609189. Hooghly RGCSM West Bengal Study Centre Phone number is 9903700712 / 9038678454 / 9836028411. Howrah RGCSM West Bengal Study Centre Phone number is 9051404124 / 9051442822. 24-Pgs (N) RGCSM West Bengal Study Centre Phone number is 9563903456 / 9153116824. South 24 Parganas RGCSM West Bengal Study Centre Phone number is 8926570025 / 9735571789. Interested students are hereby requested to visit www.rgcsm.co.in website of Rajeev Gandhi Computer Saksharta Mission to find out more Study Centre phone numbers of West Bengal and for course fee structure of RGCSM Training Centres. 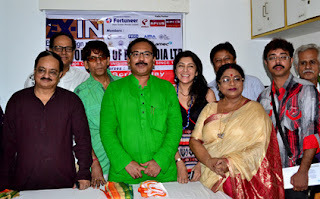 Exin Media Ltd Kolkata, Film & Television Institute, has been established by Corporate House Exin to provide training to the aspirants’ candidates who want to make career in films, television, production & other sectors of media. Exin Media Ltd Kolkata Academy offers comprehensive training method both in theoretically & practical training on film-making & acting through its good syllabus & best infrastructure. Exin Media Ltd Kolkata Academy, ISO 9001:2008 certified Finishing School since 1986, in collaboration with Mewar University (www.mewaruniversity.org) provides the opportunity to get proper grooming & training from stars like Rituparna Sengupta, Kalyan Chatterjee, Dulal Lahiri, Arindam Ganguly, Shakuntala Barua & others. Diploma in Film Direction, Certificate course in Acting, Certificate course in screenplay writing, Certificate course in Television Journalism, Certificate course in Anchoring, Certificate course in Film appreciation, Certificate course in Video production & Direction, Diploma in Cinematography, Certificate course in Film Editing, Certificate course in Sound Engineering, Certificate course in Modelling and Certificate course in Multimedia & Graphics. Exin Media Ltd Kolkata Academy also offers special Acting & Grooming courses for Kids. • Exin Media Ltd Kolkata Academy Address: - 152, S.P. Mukherjee Road, 5th Floor, Abhishek Point Building, Rashbehari Crossing, Kolkata-26. • Exin Media Ltd Kolkata Academy Phone contact number: - 98361-37666 / 98309-95421. • Exin Media Ltd Kolkata Academy Email ID: exinmedia1@gmail.com. Exin Media Institute Camac Street Kolkata phone contact number is 033-22837261. Exin Media Institute Bowbazar Kolkata phone contact number is 08820297659. Exin Media Institute Salt Lake Kolkata phone contact number is 9830009639. Exin Media Institute Behala Kolkata phone contact number is 033-32561945. Exin Media Institute Bagnan Howrah phone contact number is 0321432088. Exin Media Institute Domjur Howrah phone contact number is 033-32561945. Exin Media Institute Durgapur Burdwan phone contact number is 0343-3207665. Exin Media Institute Siliguri, North Bengal phone contact number is 7797928212. Please visit www.exinmedia.co.in website to get latest admission notification and course fees of Exin Media Ltd Kolkata Academy. Taxation & e-Accountant Training admission Bengal Tax Counsel Kolkata minimum eligibility criteria qualification parameters requirement admission Bengal Tax Counsel Kolkata Taxation & e-Accountant Training application form download online apply process date schedule Taxation & e-Accountant Training admission Bengal Tax Counsel Kolkata address phone contact number details. Applications are invited from the eligible & interested candidates for the admission to Taxation & e-Accountant Training at Bengal Tax Counsel Kolkata for the academic session starting next. Let’s check the details information about Taxation & e-Accountant Training admission below. Tax Consultant Training – Candidates will get to know about VAT, P. Tax, Income Tax, Service Tax, Excise, ESI & P.F. Candidates will become a professional in Online taxation System department after completion of Tax Consultant Training course at Bengal Tax Counsel, Kolkata. e-Accountant Training Course – Candidates will be trained in Tally ERP 9, Taxation & e-filling system. • Taxation & e-Accountant Training Admission Bengal Tax Counsel Kolkata eligibility criteria: - Law Graduates are eligible for Tax Consultant Training course admission and B.Com Graduates are eligible for e-Accountant training course admission. Address Location of Bengal Tax Counsel Kolkata: - 11, Ananda Palit Road, Beside Entally Post Office, Kolkata-14. Phone Contact Number of Bengal Tax Counsel Kolkata: - 033-22261326 / 033-22495962 / 9330825357. Website of Bengal Tax Counsel Kolkata: - www.bengaltaxcounsel.com. • Taxation & e-Accountant Training Admission Bengal Tax Counsel Kolkata Application Procedure: - Interested candidates who want to make career as Tax Consultant or e-Accountant should contact Bengal Tax Counsel Kolkata centre for admission to get quality training on Taxation, Tally, ERP, e-filling etc. Applicants are requested to visit www.bengaltaxcounsel.com or to call 033-22261326 phone number to get latest admission schedule. For Taxation & e-Accountant Training Admission in Bengal Tax Counsel Kolkata interested candidates are requested to apply within the scheduled dates for Taxation & e-Accountant Training admission in Bengal Tax Counsel Kolkata. Youth’s Institute of Education for Language & Development (YEILD) Kolkata, Government registered, in the best Training Centre of Kolkata providing English, French, Spanish etc language courses at cheap course fees. Those who are looking for trust-able training Institute to learn various Languages in Kolkata are welcomed to Youth’s Institute of Education for Language & Development (YEILD) Kolkata because the Certificate provided is approved by Government and acceptable everywhere. Youth’s Institute of Education for Language & Development (YEILD) Kolkata offers Basic, Advanced & Crash Courses in English, French, Spanish, Japanese & other languages. Spoken & Written English course is also available to develop the skills of the students and to make them Industry preferable. All Days open | Reasonable course fees | High Class Faculty | AC Classrooms | Flexible course timings | Audio Video Teaching method | Free Internet Access | 1:1 attention given etc. • Address of Youth’s Institute of Education for Language & Development (YEILD) Kolkata: - 40/1, M.G. Road, 2nd Floor, Purabi Cinema Hall Building, Sealdah, Kolkata-9. • Phone contact number of Youth’s Institute of Education for Language & Development (YEILD) Kolkata: - 033-23523942 / 9674127388. Interested candidates seeking admission at Youth’s Institute of Education for Language & Development (YEILD) Kolkata are advised to visit www.yield.org.in to get latest admission notifications and course fees at YIELD Kolkata Centre. Gurukul has opened yet another perfect activity centre at Salt Lake on & from 17th February 2012. Those who are looking for Crèche nearby Salt Lake, Montessori School near to Salt Lake, training centre to learn Horse Riding & Skating etc; will be benefitted by Gurukul Salt Lake Centre which is a perfect activity centre with all necessary facilities that requires to develop your kid. Gurukul Salt Lake Kolkata, situated just behind of Salt Lake City Centre, has the option of all types of activities like sporting, educational, extracurricular activities etc. - Life Style Courses at Gurukul Salt Lake Kolkata: Life Style Courses includes Entertainment Courses (Western Dance, Bharatnatyam, Kathak, Classical Singing, Modern Singing, Guitar, Tabla, Synthesizer, Djing), Sports Category (Roller Skating, Karate, Table Tennis, Horse Riding, Kick Boxing) and Health Category (Yoga, Meditation, Aerobics, Gymnasium etc). - Educational Courses at Gurukul Salt Lake Kolkata: Computer, Abacus, Vedic Mathematics, Spoken English, art & Craft, Smart Classes etc. - Professional Courses at Gurukul Salt Lake Kolkata: Multimedia Designing, Software Languages, Photography, Acting & Modeling, Hardware Engineering & Maintenance Networking, Mobile Device Management, Business Communication & Office Administration, Professional Dance etc. - Crash Courses at Gurukul Salt Lake Kolkata: Personality Development, Computers, Western Dance, Table Tennis, Calligraphy, Vedic Mathematics. - Gurukul Kids Courses at Gurukul Salt Lake Kolkata: Montessori, Nursery, Lower KG, Upper KG Classes, Crèche etc. • Gurukul Salt Lake Kolkata Address: - CB-187, Sector-1, Behind City Centre, Kolkata-64. • Gurukul Salt Lake Kolkata Phone number: - 9230080118 / 9230062343. Gurukul Activity Centre has few more branch centres at various places of Kolkata like Baguiati, Patipukur, Ashwininagar, Space Circle and Ram Mandir area of Kolkata. Gurukul Activity Centre is going to open few more Gurukul Activity Centres in Howrah & Hooghly district of West Bengal nearby Kolkata and the upcoming Gurukul Activity Centres will be opened at Salkia, Belur, Howrah Maidan, Mandirtala and Uttarpara soon. Sumangal Institute of Business Administration, Kolkata is a Unit Of Sumangal Industries Limited to serve career oriented Business Management, Marketing sort of courses in Kolkata at cheap course fees and with the assurance of job after competition of courses through Sumangal Institute of Business Administration, Kolkata. Sumangal Institute of Business Administration, Kolkata is the one & only Institute that offers appointment Letter during the Admission time & placed in job within 15-days after the course completion. Sumangal Institute of Business Administration, Kolkata has the Wi-Fi enabled campus with well equipped computer lab & library. All the class rooms of Sumangal Institute of Business Administration, Kolkata are air-conditioned and faculty members are University Professors, Industrialists, Bank Officials, Advocates, Chartered Accountants etc so that students can learn the most. Sumangal Institute of Business Administration, Kolkata offers different job oriented multilevel marketing management courses with one year duration for the students who have completed Madhyamik, Higher Secondary & Graduation. PG Diploma in Multi Level Marketing (PGDMLM) course fee is Rs.150000/-, Advanced Diploma in Multi Level Marketing (ADMLM) course fee is Rs.100000/- and the course fee of Diploma in Multi Level Marketing (DMLM) course in Rs.50000/- at Sumangal Institute of Business Administration, Kolkata. Sumangal Institute of Business Administration, Kolkata will issue appointment letter at the time of admission of each courses and provides joining date within 15-days after successful completion of the course. Mostly jobs of Manager MLM, Development Officer MLM, Assistant Development Officer etc posts are given to the students of Sumangal Institute of Business Administration, Kolkata. Address of Sumangal Institute of Business Administration, Kolkata: - A11 & A12, 20th Floor, Chatterjee International, 33A J.L. Nehru Road, Kolkata-71. Phone number of Sumangal Institute of Business Administration, Kolkata: - 033-40178900. Email id of Sumangal Institute of Business Administration, Kolkata: - sumangal.industries@rediffmail.com. Candidates should visit www.sumangalindustries.net website of Sumangal Institute of Business Administration, Kolkata for Admission procedure & to know more about Sumangal Institute of Business Administration, Kolkata. National School of Banking (NSB) Kalighat Training Centre of Kolkata, located at Kalighat Library Road, is there for you all, who are looking for best Training & Guidance Centres for Banking Sector Job Exams nearby Bhawanipore, Gariahat, Ballygunge, Tollygunge, Kalighat etc places of South Kolkata. Banking Sector is going to recruit in huge numbers in coming years; so it’s the time to get prepared for Banking Sector Jobs before appearing for Bank Recruitment Examinations. National School of Banking (NSB) is the first pioneer & largest Bank Pre-Recruitment Training Institute in India and has the Head Office at Dadar, Mumbai. With the growing popularity & need of best support, National School of Banking (NSB) has now opened in-class Banking Training Centres of NSB at Kalighat of South Kolkata for providing proper guidance to the people interested in Banking jobs in Kolkata (West Bengal). National School of Banking (NSB) Kalighat Kolkata Training Centre provides pre-recruitment Banking courses for Bank Probationary Officer (P.O. ), Clerical, Managerial job recruitment exam guidance and secures your place in banking jobs. • Kalighat National School of Banking (NSB) Centre Address: 5A, 1st Floor, Manmoyee Apartment, Library Road, Kalighat, Kolkata. • National School of Banking (NSB) Kalighat Phone contact number: 033-24198691. National School of Banking has two more NSB Centres in Kolkata one at Sealdah (NSB Centre at Central Kolkata) and another one at Madhyamgram (NSB Centre at North Kolkata) for the aspiring candidates who want to make career in Banking sector. National School of Banking (NSB) Sealdah Training Centre of Kolkata is there for you all, who are looking for best Training & Guidance Centres for Banking Sector Job Exams nearby Belgachia, Kankurgachi, Moulali, CIT Road etc places of Central Kolkata. Banking Sector is going to recruit in huge numbers in coming years; so it’s the time to get prepared for Banking Sector Jobs before appearing for Bank Recruitment Examinations. National School of Banking (NSB) is the first pioneer & largest Bank Pre-Recruitment Training Institute in India and has the Head Office at Dadar, Mumbai. With the growing popularity & need of best support, National School of Banking (NSB) has now opened in-class Banking Training Centres of NSB at Sealdah of Central Kolkata for providing proper guidance to the people interested in Banking jobs in Kolkata (West Bengal). National School of Banking (NSB) Sealdah Kolkata Training Centre provides pre-recruitment Banking courses for Bank Probationary Officer (P.O. ), Clerical, Managerial job recruitment exam guidance and secures your place in banking jobs. • Sealdah National School of Banking (NSB) Centre Address: 11C, 1st Floor, Ramnath Biswas Lane, Sealdah, Kolkata. • National School of Banking (NSB) Sealdah Phone contact number: 033-64534022. National School of Banking has two more NSB Centres in Kolkata one at Madhyamgram and another one at Kalighat for the aspiring candidates who want to make career in Banking sector.